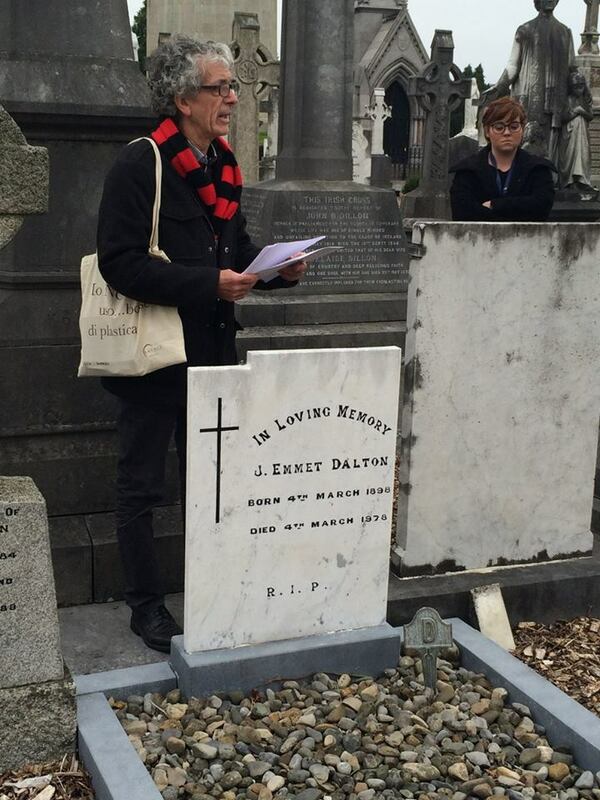 A selection of Glasnevin Cemetery graves connected to Bohemian FC from the recent tour conducted by Brian Trench as part of series of events to mark the club’s 125th anniversary. Emmet Dalton died on his 80th birthday in 1978 and was given a military funeral as a former National Army officer and War of Independence fighter. He fought in World War 1, remaining in the British Army till 1919, when he returned to Dublin and joined his younger brother, Charlie, in the IRA Dublin Brigade and as a player with Bohemians for one season. He was with Michael Collins when Collins was shot in 1922 and became a Major-General in the National Army after the Civil War. Dalton served as Clerk of the new Senate, 1923-25 and, for one of those two years was also President of Bohemian FC as well as a leading amateur golfer with Hermitage GC. He later founded Ardmore Studios and was a film producer and friend of the stars. 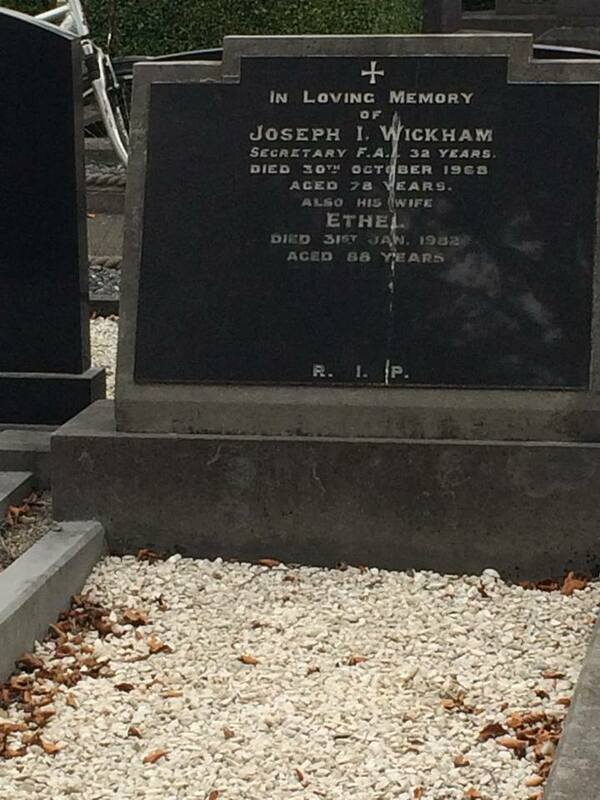 Joe Wickham was the longest-serving senior official of a national football association when he died in 1968, after 32 years as secretary of the FAI. He served in various positions on the Bohemian FC committee over ten years before joining the FAI in 1936. 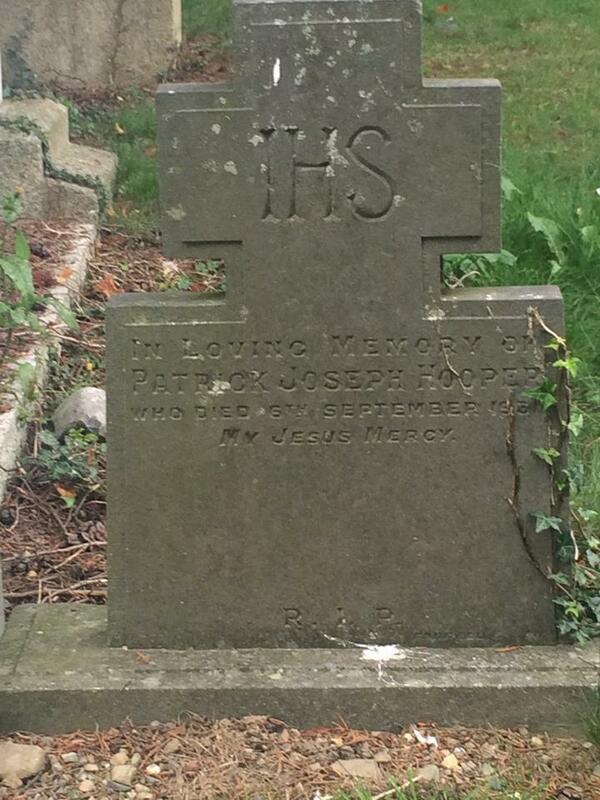 He was born in 1890 and attended St Peter’s National school, beside Dalymount Park.  He worked in Broadstone coach works, becoming a supervisor. As FAI Secretary Wickham invited the new president, Douglas Hyde, to a 1938 home international against Poland, which led to Hyde being removed as patron of the GAA. In 1955, Wickham resisted pressure from Archbishop McQuaid to call off a match against Yugoslavia and was denounced from the pulpit in his local church in Griffith Avenue. 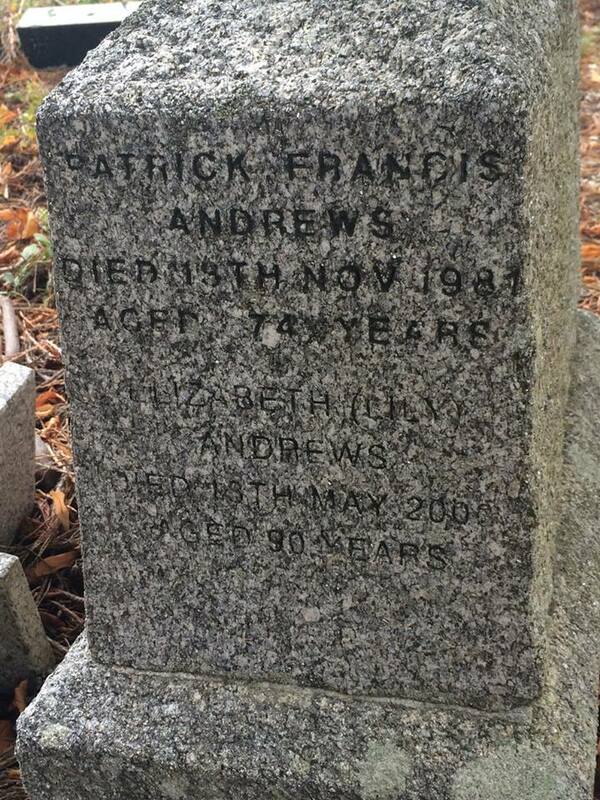 Paddy Andrews was a civil servant in Customs and Excise for all of his working life and was living in Dundrum when he died in 1981. His and his older brother C. S. ‘Todd’ Andrews – who became chairman of several state companies – had started life in Summerhill but moved as young children to Terenure and went to Synge Street CBS. Paddy was a minor county footballer and a champion field athlete before he concentrated on soccer, playing for Drumcondra and UCD and joining Bohemians in 1928. A tall defender, he won the league twice and the FAI Cup with Bohemians, ending his decade of club service as team captain in 1936-37. He made one international appearance in 1935 against Holland. 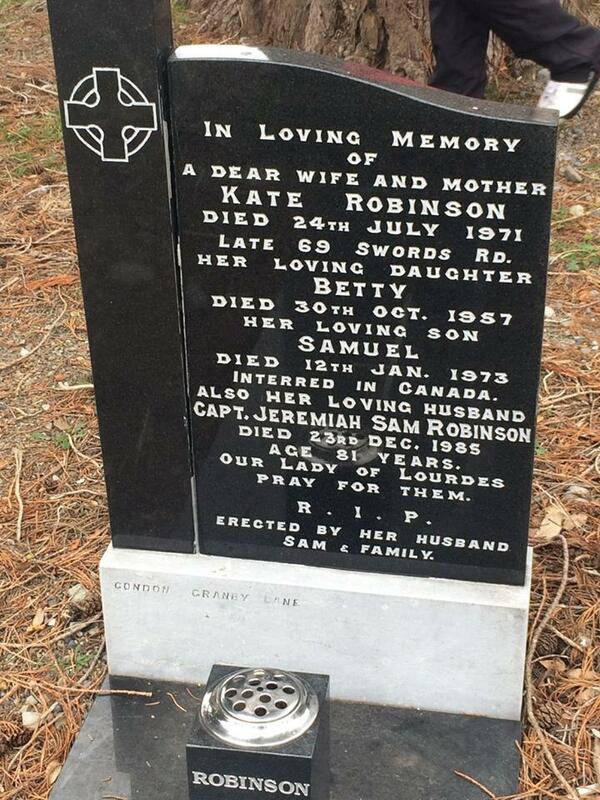 Paddy Walsh was living in Sandymount, when he died in 1985, the same year as Sam Robinson. 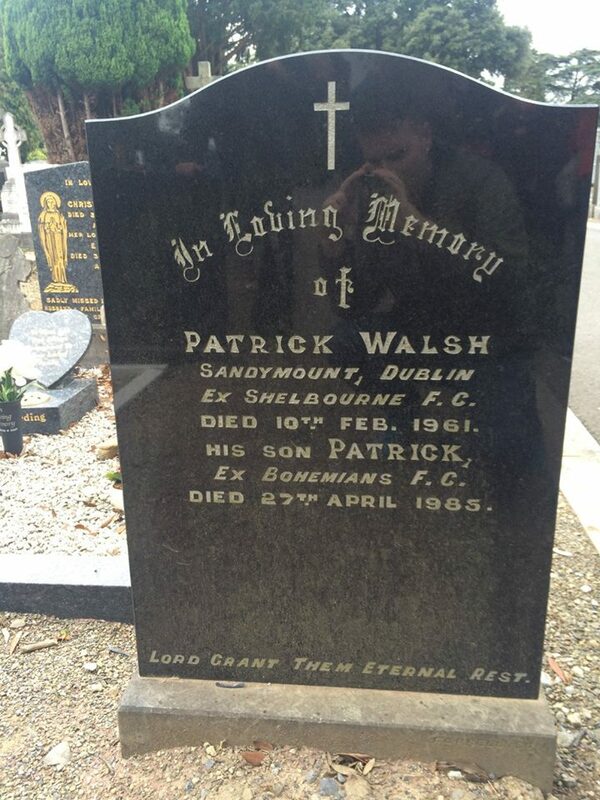 He is buried with his father, also Paddy, who was Shelbourne’s goalkeeper from 1915 to 1928. Paddy, junior, a left-winger, played for Bohemians for seven seasons between 1938 and 1947, making 92 appearances, and scoring 29 goals and winning the Shield and Leinster Cup. Sam Robinson kept the gold watch he was given after Bohemians won the FAI Cup in 1928 for nearly sixty years up to his death in 1985. He had joined the IRA as a 17-year-old and later rose to captain in the National Army. He and his older brother Christy were part of the all-conquering 1927-28 Bohemians team. Sam won Ireland caps in 1928 and 1931, making his international debut alongside fellow-Bohemians (and fellow-army captain) Harry Cannon, Jimmy White and Jack McCarthy. Sam and Christy Robinson were the first brothers to play for an Ireland team. Christy – who is not buried in Glasnevin – scored Bohemians’ first FAI Cup goal in 1922, was the club’s top scorer in 1922-23 and was included in Ireland’s Olympic squad in 1924. Gerrard O’Sullivan died in 1931 from injuries received while playing for Bohemians, the only footballer to lose his life in club action. O’Sullivan was making only his third first-team appearance in a Shield match against Bray Unknowns when he collided in the air with an opponent. He played on for some time, but was withdrawn due to a leg injury. He went to hospital that evening and died the next day from his head injury. 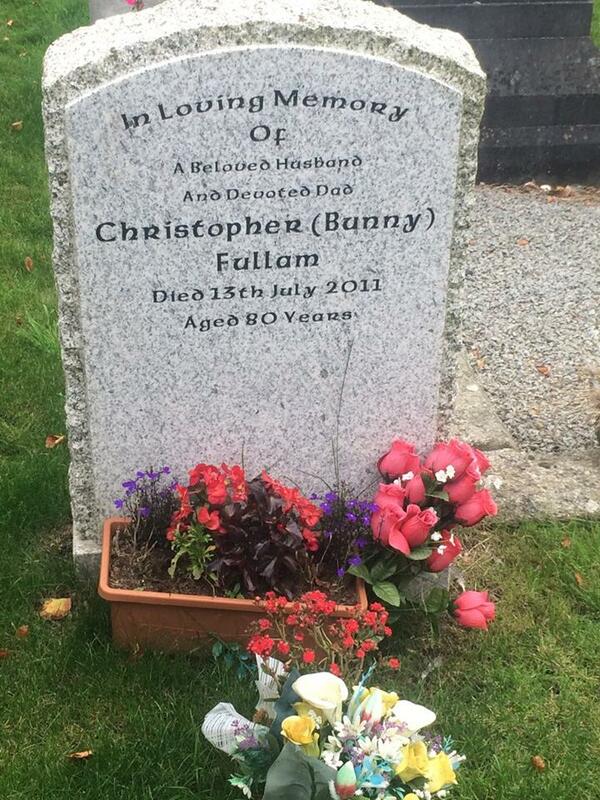 O’Sullivan was from Ballybough, a clerk in Dublin Corporation, and just 22 years old. A large cortege accompanied his coffin from Jervis Street hospital to St Agatha’s Church in the north inner city. The attendance at the funeral included Lord Mayor Alfie Byrne, then also a senator, other councillors leading representatives of the football community. 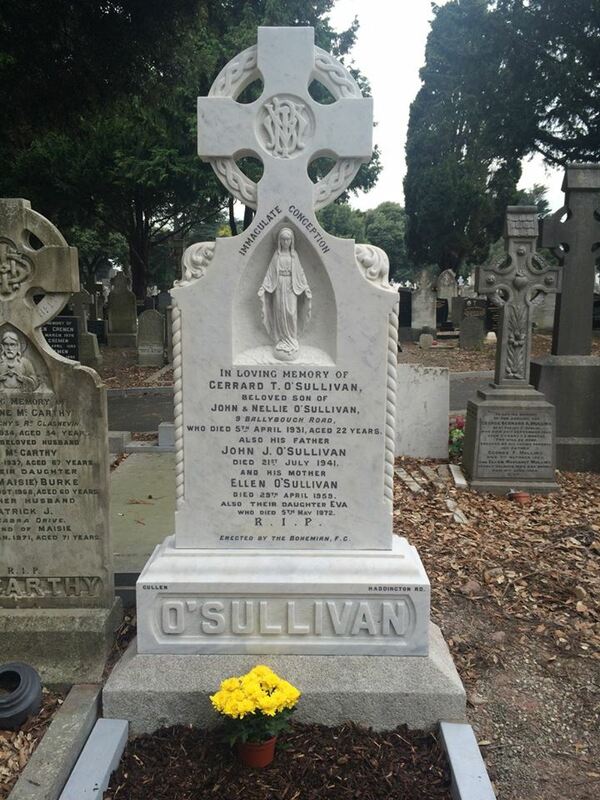 O’Sullivan’s burial and gravestone were paid for by Bohemian FC. Richard Hooper was a parliamentary reporter for The Irish Times when he died in 1931, and his funeral was attended by leading political figures of the day. He played with Bohemians from 1900, scoring in the first game at Dalymount Park in 1901 and becoming club captain in 1904-5. His younger brother Willie joined Bohemians in 1901, while a student at Castleknock College and was also later club captain, 1909-10. Both Hoopers were members of Bohemians’ Irish Cup-winning team of 1908, both also scoring in the final. Richard and another brother, Patrick, were buried in the same plot within a few months of each other. Patrick was editor of the Freeman’s Journal and their father, John, was an Alderman and MP in Cork who also edited and owned newspapers. Christopher ‘Bunny’ Fullam was best-known as a Drumcondra FC legend, playing at right full-back for Drums for a decade up to the mid-1960s.